The 2015-16 NBA season has started on a record pace for two teams. The Golden State Warriors have avoided a NBA Championship hangover with an incredible 17-0 start to the schedule, breaking the record for best all-time start to a season and garnering comparisons to the 1995-96 72-win Chicago Bulls. At the other end of the standings, the Philadelphia 76ers are making history of their own – the wrong kind of history. Philadelphia has limped out to a 0-17 record to tipoff the 2015-16 campaign - one loss away from the all-time worst start to a season - and has actually lost 27 games in a row going back to last year, which is a new NBA-worst losing slide. 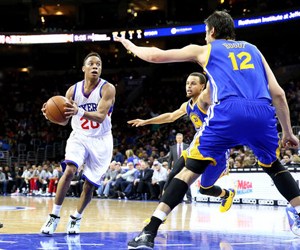 With these mirror image streaks by the Warriors and Sixers eating up the NBA headlines, the fun-loving oddsmakers at Sportsbettingonline.ag have cooked up some interesting props involving these two franchises headed in opposite directions. Sportsbettingonline.ag is offering a NBA prop on what will happen first: Golden State loses or Philadelphia wins? The 76ers winning before the Warriors lose is priced as a -160 favorite (bet $160 to win $100) while the Warriors taking a tumble first is listed at +140 (bet $100 to win $140). Basketball bettors can also wager that Golden State will not lose a single game and Philadelphia will go winless for the entire season, offering that long shot at +100,000 (bet $100 to win $10 million). The Warriors are in action at home versus Sacramento Saturday night, set as 15.5-point favorites. Following that game, the reigning champs hit the road for an extended trip, traveling to Utah Monday, Charlotte Wednesday, Toronto Saturday, and Brooklyn Sunday. Golden State wraps this seven-game road swing at Indiana, Boston and Milwaukee – ending on December 12. The Warriors are 8-0 on the road this season and 4-0 versus Eastern Conference opponents. Last season, they finished 29-7 against non-conference foes – the best record in the NBA. For the 76ers, they are back in action at Memphis Sunday then have a solid chance to pick up a win against the punchless Lakers at home Tuesday. Following that opportunity, Philadelphia travels to New York Wednesday, then hosts Denver Saturday and San Antonio Monday. Los Angeles, New York and Denver have a combined win/loss record of 16-31, so the window is open for Philly to snuff out this skid sometime in the coming week. Check out Sportsbettingonline.ag to get action down on this unique and exciting prop as well as daily NBA odds and season props and specials. For an interview request regarding one of our PR/'s please email pressrelease@sbo.ag. Add the name of the PR in the subject field. We will do interview requests for any type of media.